Lab Manager 4 can shorten a system administrator's task list by enabling users to clone, snapshot and destroy virtual machines without granting them access to the entire VMware infrastructure. 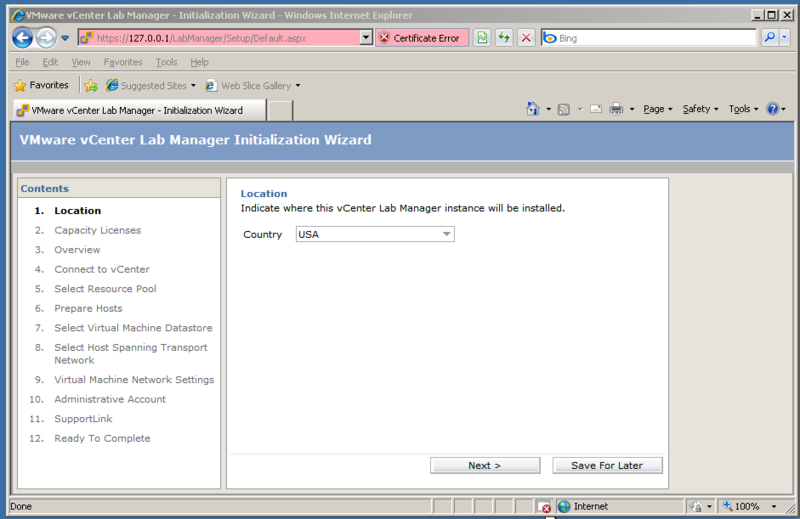 Learn how to install Lab Manager and learn how it might work in your environment. You're probably already aware of this, but as a system administrator, it's not in your best interest to grant your development team full access to your VMware infrastructure. Too many chefs can ruin the soup – a developer could make a change that you disagree with causing downtime, or vice versa. You also want to limit the core resources that developers can consume, and for how long. So how do you provide all the benefits of VMware to your development team without having them constantly ask you for new virtual machines (VMs)? VMware vCenter Lab Manager 4 provides an interface for a development team to provision, use, snapshot and destroy its own VMs -- a plus for the team and for you. It helps you avoid unnecessary interruptions to an already overloaded day. In this article, I'll outline some quick Lab Manager facts, walk you through installation and set up, and then present a scenario to show you how Lab Manager could work in your environment. The program's proper name, vCenter Lab Manager 4, is installed on a Windows Server, preferably as a virtual machine (VM). Since it's installed on a Windows Server, it requires Internet Information Server (IIS) and .NET 2.0. 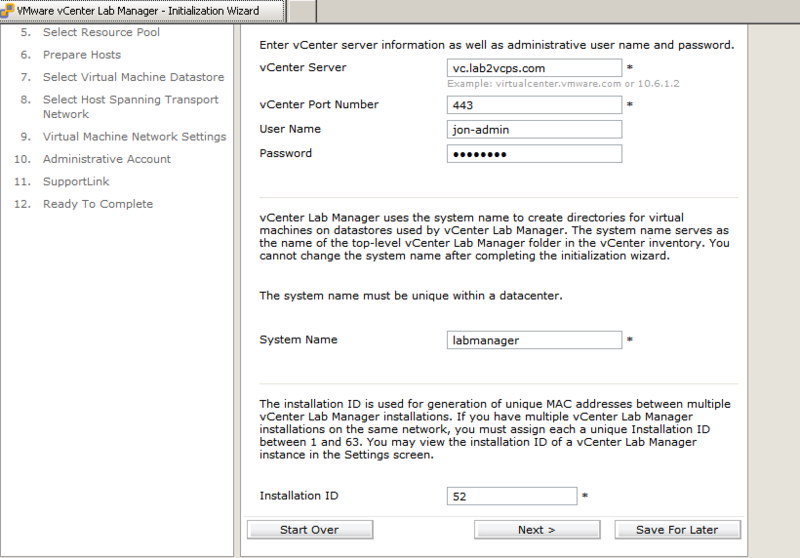 VMware vCenter 4.0 is required for Lab Manager 4. The administrative user you create for Lab Manager is not in Active Directory, nor is it a local user account in Windows. It is in the Lab Manager user database. Don't lose this password. Licenses for Lab Manager are sold per CPU of the ESX servers that you will use with Lab Manager. If you plan on using a resource pool to define resources for an organization within Lab Manager, all the ESX servers that have that resource pool must be licensed. Installation is straightforward, and there is no need to reprint the documentation. 1. If you pass all the prerequisite checks, select Custom and choose the location where you want Lab Manager installed. 2. Keep the auto-generated passwords for the LMweb and LMuser service accounts. The next few choices should enable you to choose based on what is best for your environment. If this is a dedicated Lab Manager server, the default choices are best. The actual install and setup is completed while you initiate Lab Manager for the first time after the initial installation. 4. Walk through the initialization wizard. This connects your Lab Manager server to vCenter. Here you can select resource pools, data stores, and network settings, as shown below. 5. You will now select a resource pool and prepare the ESX hosts. This installs the Lab Manager agent on the ESX server. The agent enables the linked clone features used by Lab Manager to reduce the disk requirements of Lab Manager virtual machines. 6. 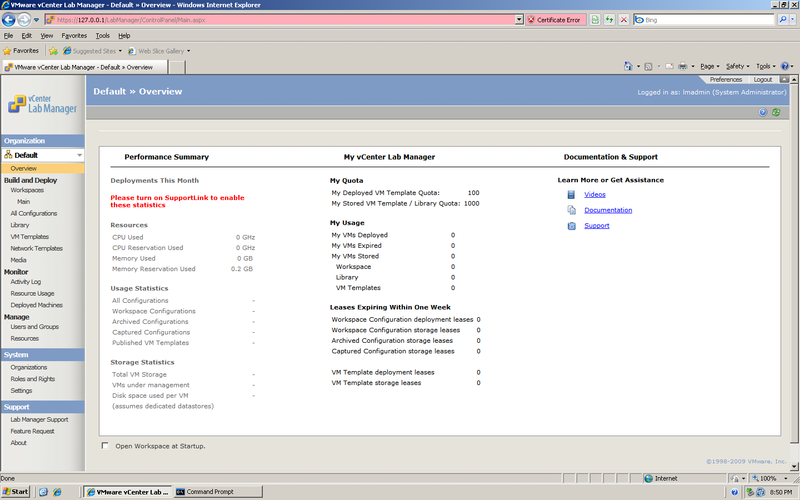 Enter connection credentials for each ESX host so Lab Manager can install Lab Manager agents. 7. Select the data stores you want to use with Lab Manager. Ensure that every ESX host you plan to use with Lab Manager can access them. 8. The next selection is about the host spanning transport network. This network will not be available unless you use a vNetwork distributed switch. This feature allows you to create private networks for Lab Manager virtual machines to span across different ESX hosts. This is useful for large lab scenarios that require more resources than one host can provide but still need to keep the virtual machines separate from the public network. 9. Now select the VM network settings. Here you can create a new virtual switch and set the virtual local area network (VLAN). You can choose to set up to three types of Layer 3 network settings. The first choice is Static – Pool. You create a pool of IP addresses and set the network settings beforehand. Then, as VMs are created, the custom deployment used by Lab Manager hard-codes the IP based on what is unused in the pool. The second choice is dynamic host configuration protocol (DHCP). 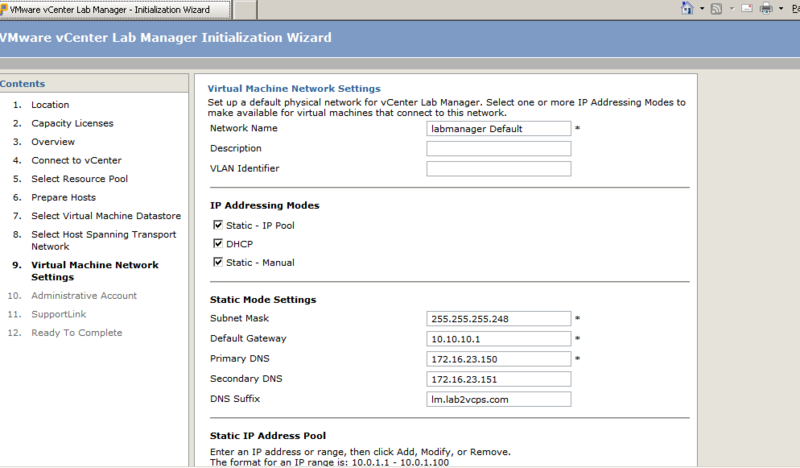 Lab Manager virtual machines will be set to DHCP and pull IPs from an external DHCP server. The final choice is Static – Manual, and this option allows you to set the IP as the virtual machine is deployed. You can initially set all these options and then limit what a specific user can use for IP options based on permissions. DHCP is always an easy option, but the Static – Pool option is great for private networks that may not have DHCP. From there., installation is not too complicated, and the setup wizard is easy to use, so I won't go into detail on how to do this. Now that we've installed VMware Lab Managerhere's a development team scenario that shows you how you can provide the best service to your development team with the least amount of daily interaction required by you, the VMware administrator. 1. Create a New Workspace in the default Organization (or in a new Organization if you created one), and add your development team. 2. Create the workspace as a "shared" workspace. This allows your development team to work together in the environment once the new workspace is created and multiple users are assigned to it. 3. 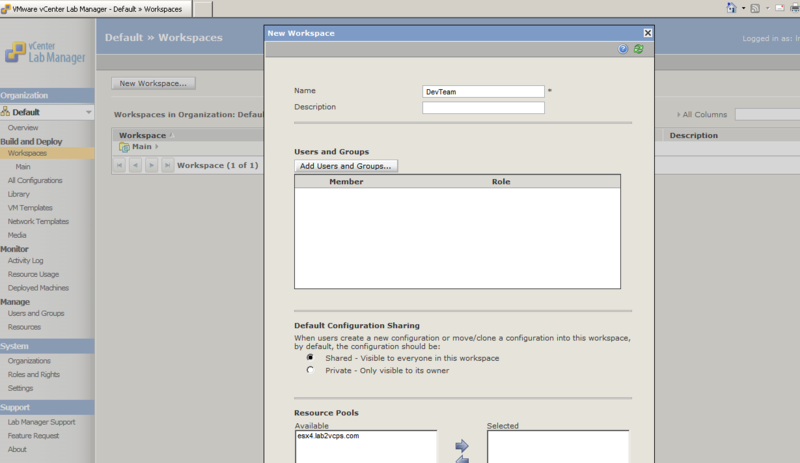 Select the workspace you just created and choose to create a new configuration. Because this is a basic configuration, we will deploy one Windows 2008 server. This will allow the development team to deploy and use the virtual machine. They can power it on, make snapshots, and clone the VM without needing the administrator. The Lab Manager Web user interface (UI) has a built-in console feature that allows users to control the virtual machine, although using a Remote Desktop Protocol (RDP) solution is generally smoother. The best part of the deployment is that as the servers are deployed, even if they are deployed multiple times, the linked clone feature ensures that only the changes to the original are written to disk. The developers can decide to keep the changes or discard them after testing. 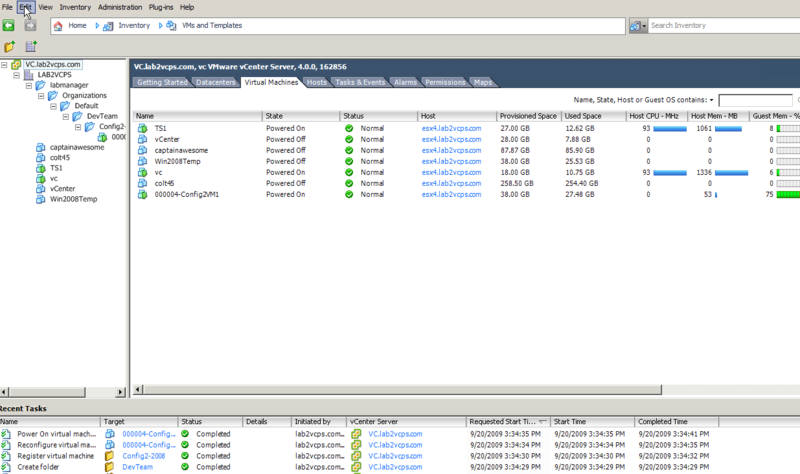 In vCenter you will see the tasks and virtual machines created by Lab Manager. Servers will clone, be live for a while and eventually be deleted when they are no longer used. While the developers collaborate with this Lab Manager virtual machine you can capture the current state of the virtual machine and copy it to the library. This copies the virtual machine state to the library that other users in the group can examine in case of an error or certain condition that the first user would like to save for later. Another team member can consolidate the library item to a new virtual disk and work on that new machine to discover and repair the error. At the same time, someone else can continue to work with the original machine. This just scratches the surface of the power of Lab Manager. After the product is up and running, the most important piece is to have your processes and workflows set up, which I'll cover in a future tip.